For about 80% of the membership of the club Doris Romanes is probably totally unknown, but Doris, who was the wife of John Romanes, the man who, with Ian Scott Watson, brought Ingliston to life as a motor racing circuit, was as enthusiastic about racing and as supportive of the Club as her husband John. John Romanes – who worked for a time at BRM – returned to his native Edinburgh around 1956 to take over the running of Lothian Chemical Company. A great racing enthusiast he settled at Davidsons Mains, Edinburgh and immediately contacted Colin Chapman and order a kit to build a Lotus Eleven. I remember visiting the house and seeing Doris with her sleeves rolled up helping John in what was a very difficult task in those days. Both of them cursed Colin Chapman as some of his kits did not quite fit together as they should and yet both Doris and John became good friends of Chapman and he was a regular customer for his racing cars. Doris was formerly a fashion model, met and married John. They had no children and in a sense Ingliston became their child, and both of them worked hard to develop the circuit, which John ran with a rod of iron. John retired from the active running of the circuit around 1982, but continued to help the club and was SMRC Chairman for a number of years. Even after his death, and when Doris Romanes was made an honorary member, she still attended the annual dinner dances to present the John Romanes Quaich and was a great supporter of Allan McNish, John Cleland and David Coulthard. In recent years she has suffered poor health, and spent most of her time in her house in Portugal. For those of us who knew her, her passing, is another sadness for Scottish motor racing. 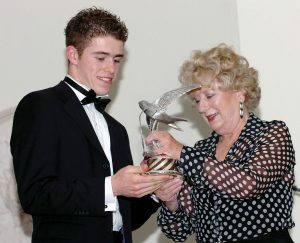 Doris pictured here in 2006 presenting Paul di Resta with the Romanes Swift. The Swift was designed by John Romanes as he felt the swift was a perfect emblem for the skill, speed and agility required of racing drivers it is awarded each year to a Driver for excellence in Motorsport . © 2017 Scottish Motor Racing Club. All rights Reserved.